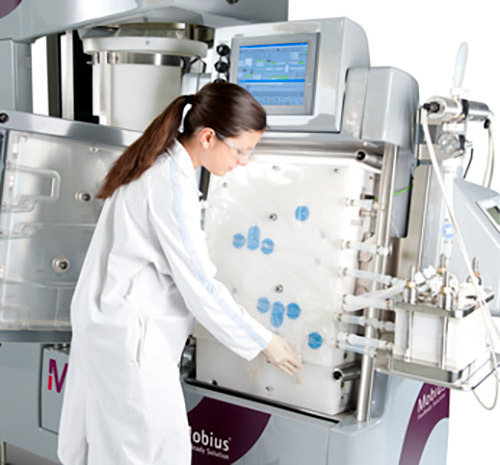 Continuous bioprocessing is generating considerable excitement in the biopharma industry as it promises to increase efficiency, decrease equipment footprint, increase facility flexibility and, ultimately, lower cost of goods. John Sterling, GEN's editor-in-chief, recently spoke to Merrilee Whitney, director of marketing, next-generation processing at MilliporeSigma, to find out more about the company’s involvement with and future plans for the continuous bioprocessing approach. For a longer version of John Sterling's interview with Merrilee Whitney listen to the podcast. GEN: What is driving the industry toward next-generation and continuous processing? Whitney: We’re seeing that our customers want to reduce the cost of goods in a way that is a much bigger change than just looking at cost reductions from the consumables that they get. They really need to make a concerted step change in terms of how their manufacturing costs are structured. Additionally, we’re seeing a need for increased flexibility in terms of their plant utilization, how they can utilize the facility fit, and we’re also looking at the potential use of single use and how customers can take advantage of the flexibility that this brings to them. Speed is another key dynamic in terms of how they can shorten processing time and get to the market more quickly. The final factors are looking at wanting to decrease the risk associated with both how they run their process, and the quality of the product they are producing, and how they are able to delay capacity expansions through the use of single-use facilities and technologies. GEN: What has motivated MilliporeSigma to enter this space? Whitney: MilliporeSigma clearly is very embedded within the biotech industry, specifically with monoclonal antibodies and other application areas. But we really want to help our customers achieve their goals and this is one of the key elements of who MilliporeSigma is. We want to partner with customers, help them solve their problems, and advance the industry. That’s a key motivator for us. We are problem solvers. GEN: How specifically are you entering this space? Whitney: We are making quite a significant investment in the areas of our next-generation processing technologies in terms of dedicated teams, dedicated R&D efforts, and product-development efforts. We are also taking a look at the areas outside of straight product development, because this is a new area for our customers. These are new technologies and a new way of processing for the industry. We recognize that it’s going to have to go much farther than just providing the right products. GEN: What are the critical technologies to enable next-generation processing? Whitney: We are clearly seeing a big drive in perfusion in the upstream space, whether it’s developing cell culture media specific to perfusion applications or perfusion bioreactors and cell-retention devices. We are also looking at how operation in perfusion mode can help customers with their seed-train operations, shortening that time. Increasing the cell densities as well as titers is helping them gain some efficiencies in that space. We’re also seeing a lot of focus in the industry around continuous chromatography and the efficiencies that can be gained there. Those are definitely critical. But there are ancillary applications as well. When you look at perfusion operation and continuous chromatography and the buffer and media demands that are made at these process steps, things like in-line dilution and buffer on-demand and media on-demand systems—these are ancillary applications that will also be extremely critical. The final piece is really around flow-through polishing, flow-through cation and anion exchange, and flow-through aggregate removal. How do you do that in a way that is single use?